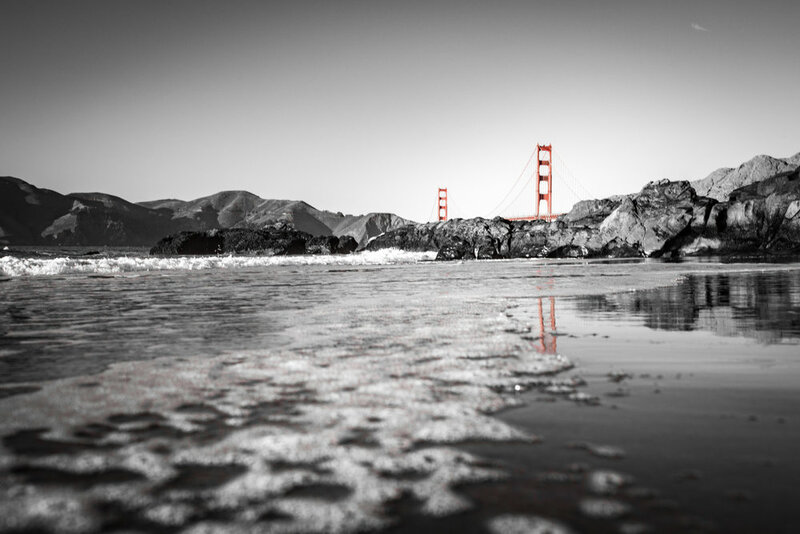 On a recent trip out to San Francisco I had about 6 solid days to get ample shots of the Golden Gate Bridge. This has been on my Bucketlist for quite awhile even though I've visited the city a number of times. This entire trip was a huge learning experience and while I didn't get every shot I wanted of the bridge I still got quite a few solid pictures to share! I will break this blog down to the different spots that I used to get these shots in the event you want to get them as well. The above shot was shot right on Lincoln Blvd looking north to the bridge. This has some easy access and there is a parking lot right across the street. I managed to get that shot using a 6 second exposure right around when the sun was dipping below the horizon. This allowed me to get the nice light streaks across the bridge. While you wont get to get any sun behind the bridge here you still get a really nice side light. I'm not really a pro-tip: There is a small wooded area in here that would make for some great proposal, wedding, engagement photos etc. Another great spot that I read about but didn't get a chance to go to is Point Cavallo. Here you get a great shot of the sun dipping behind the bridge. I read about some great spots for a sunrise of the Golden Gate Bridge but I settled with the most popular spot, Battery Spencer. This spot places the sunrise almost directly behind the bridge. I strongly suggest going well before dawn to ensure you can get a choice spot for the shot. After about 10 minutes of being there, flocks of photographers started to show up to claim their spot. I would also strongly suggest dressing warm. I went in February and was absolutely freezing from the insane winds. The first shot below was taken before dawn. I used a 25 second shutter speed to try and get some nice streaks of car lights going across the bridge but there wasn't enough traffic at that time to matter unfortunately. You can get two shots in one trip if you go extra early. San Francisco is a beautiful city and makes for some amazing night photography. I found the hardest part about this spot is not getting the exact same shot as every other photographer out there. With dozens of photographers going there daily you really have to get creative! I feel like I changed it up a little bit by getting some close up shots of the city with just some hints of the bridge in there. I wasn't totally stoked wit this shot and I think I could have framed it a bit better, but I think it was headed in the right direction. The above shot mimics that icon shot you've probably seen a ton of times. I had to use a wide angle lens for this one as it was shot at 17mm. I think I could have achieved some better light with a good graduated filter like one of the Lee Filters. I tried out my Lens Ball for the first time at this spot as well. I managed to get some better shots at other locations in San Francisco using it a few days later but I figured I would post this as an example of trying to get some unique shots of the bridge. I took this one from the Golden Gate Bridge Vista Point. If you want to get this shot I’d recommend bringing a 90mm or higher lens. To get this shot I used a 90mm lens with a tripod and used a shutter release to get a nice long exposure. There are tons of great spots to photograph the bridge during the day but I think my favorite was at Baker Beach. Now, I should warn you, because nobody warned me, Baker beach is full of stoned old dudes who like to jump around completely naked. I felt like I was in a video game and I had to navigate the naked old boss who was twirling around between me and my photography spot. At Baker Beach I found some rocks at the very north end of the beach that made for a nice foreground. I tried using these and the ocean to help give the bridge some depth. Another great spot during the day and even sunrise is Marshall Beach just to the north. I didn't get a chance to go here but I saw some shots on Instagram that were amazing. It's on my to-do list for when I go back. Above were some of the better spots I found to get pictures of the bridge. However, there are some other key spots that I will put for you quick reference. I know some of these have been referenced already but this is just to give you a quick guide! These are also in no particular order since you could make any one of these spots be amazing. 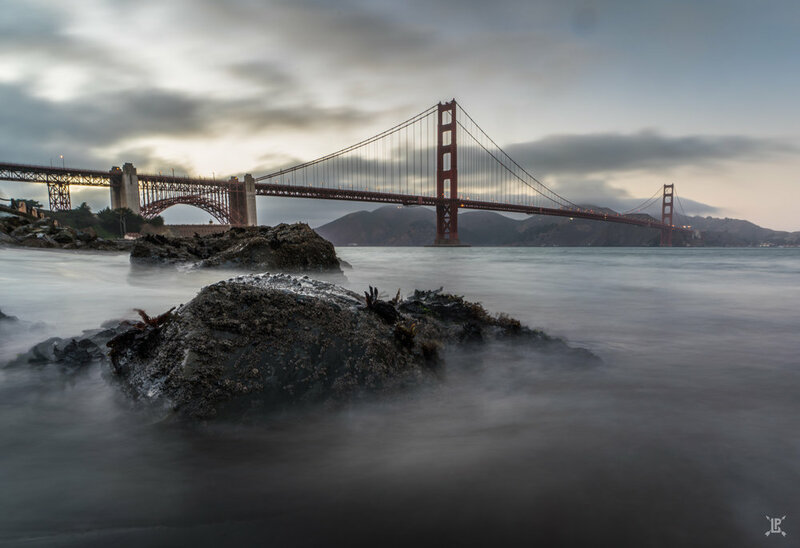 Battery Spencer- Battey Spenser offers the most iconic images of the bridge and are best for sunrise shots. Baker Beach- Baker Beach offers some distance shots of the bridge and can be an excellent spot for engagement photos. Marshall's Beach- Marshall's Beach and the road just above it make for some great below/head on shots of the bridge. If you go here be sure to bring a wide angled lens. Crissy Field- This is a great spot for sunset photos. Kirby Cove- A great spot for sunrise shots. If you go here you might want to consider camping for the night. Point Covallo- I didn't go here but I hear it's the best sunrise spot. Twin Peaks- This is a great spot for some distance shots of the bridge, be sure to bring a good zoom lens. Vista Point- I have seen some incredible shots from this area from photographers who climb up the hill and get some great long exposure shots. Take a sunset cruise!- I didn't do this but I saw some great shots from cruises that go under the bridge at sunset.